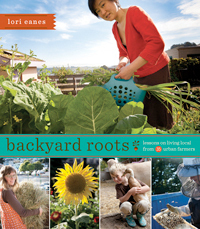 Lori Eanes, author of "Backyard Roots: Lessons on Living Local From 35 Urban Farmers." Photographer Lori Eanes became fascinated with urban farmers after reading books about the downside of our industrial food system. 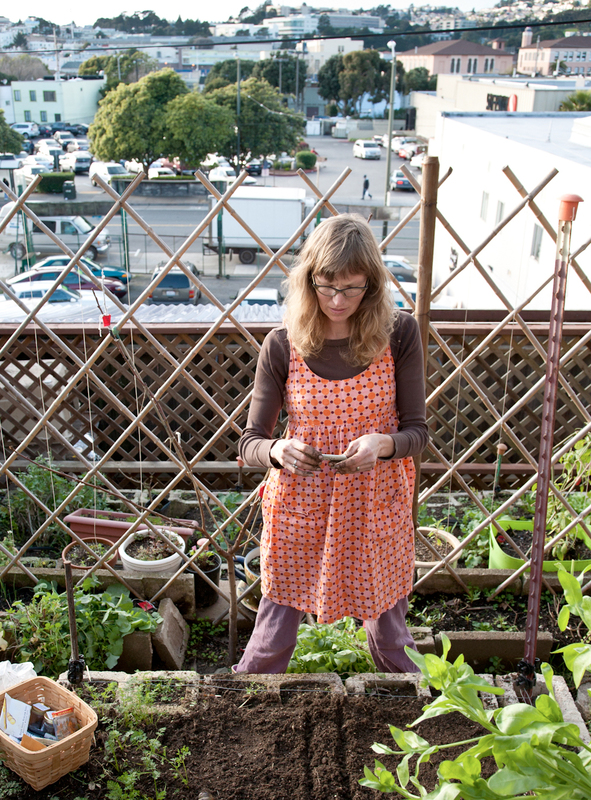 When the down economy left her with time on her hands and searching for a fun project, she focused her lens on the people who have turned their backyards into farms in West Coast cities from Berkeley up to Vancouver. Their farms and stories take center stage in her new book, "Backyard Roots: Lessons on Living Local From 35 Urban Farmers." "They are all pretty unique, but many have the same goals," Eanes says. "They want to eat healthy, they are usually into sustainability. They want organic [food], to not be a part of factory food." "Backyard Roots: Lessons on living local from 35 urban farmers"
Yet each had different approaches to urban farming. 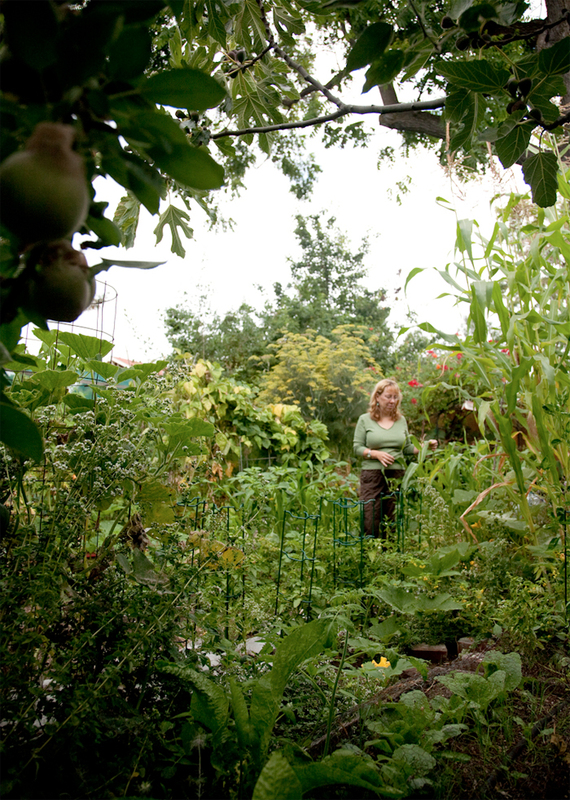 Some were forced into activism and worked to changed laws, including Laura Allen of Oakland, an urban farmer whose efforts contributed to new regulations making it easier to use greywater for residential irrigation. Others turned their backyard farms into business opportunities. Krista and David Arias, for example, transformed their Portland, Oregon, urban farm into a bed-and-breakfast; while Seattle's Joan Engelmeyer combined her art career and urban farm to create the City Art Farm program for kids. Some, like Farm Saeturn, just had cool backstories that illustrated their connection to the soil. Saeturn -- yes, her first name is really Farm -- tends several plots in a Seattle community garden the same way her family once did before they were forced to flee her native Laos: with a machete. "When I was just up there, she was chopping up plants with a machete on a wood block and adding it to the soil immediately," Eanes says. "I love seeing her because she's always wearing these crazy patterns with a great big hat. She's from another world." Eanes actually met more than 70 urban farmers but couldn't include them all in the book, so she started a blog to continue the journey. Ultimately, she hopes the project will get people thinking about all the neat things they can grow in their own backyards or outdoor spaces, even if it's just a window ledge. "The whole book is about being inspired and getting ideas," she says. "I just wanted this book to give some hope and show here's what you can do without a lot of money and it's really fun." 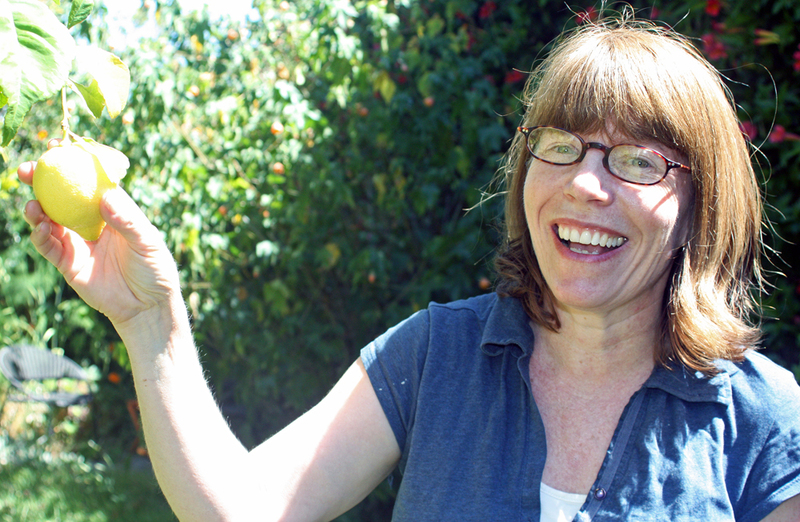 It's not too late to still take advantage of the Bay Area's 10-month growing season, says Birgitt Evans, an Alameda County master gardener spotlighted in Eanes' book and co-owner of Pollinate Farm & Garden in Oakland. Between now and August, we can still plant many summer crops, such as zucchini, cucumber, beans, winter squash, basil, tomatoes (determinate tomatoes that take less time to produce), corn and all the root crops, including carrots, beets, parsnips and turnips, Evans says. In early August, she recommends starting seedlings for crops such as cauliflower, broccoli and kale, all of which can be transplanted into the ground in September. You don't have to have the ambition of an urban farmer to grow simple edibles for your table, Evans and Eanes say. We asked both, along with Heidi Kooy, a San Francisco urban farmer in "Backyard Roots," for advice to help people get started. You don't need to invest a lot of money to get your garden off the ground. If you take on too much, you might get overwhelmed. Perhaps start with a couple quick wins, such as herbs and lettuces, before you begin experimenting and expanding. Pick the brightest spot in your outdoor space for most crops, but you can also take advantage of crops that grow well in partial sun, such as leafy greens. Kooy recommends doing an analysis of your soil to get an idea of any heavy metals that might be present. Build up the soil with compost mixed into the top soil before planting, or as a side dressing around crops already planted. Consider adding nitrogen and phosphorus fertilizers since most California soils are deficient in these nutrients, Evans says. "Soil is the basis for everything in your garden," Evans says. "That soil is going to help you get healthy plants, and healthy plants will resist diseases much better than unhealthy plants." Eanes grows snow peas, greens and tomatoes in her backyard -- all things she loves to to eat, therefore ensuring nothing goes to waste. 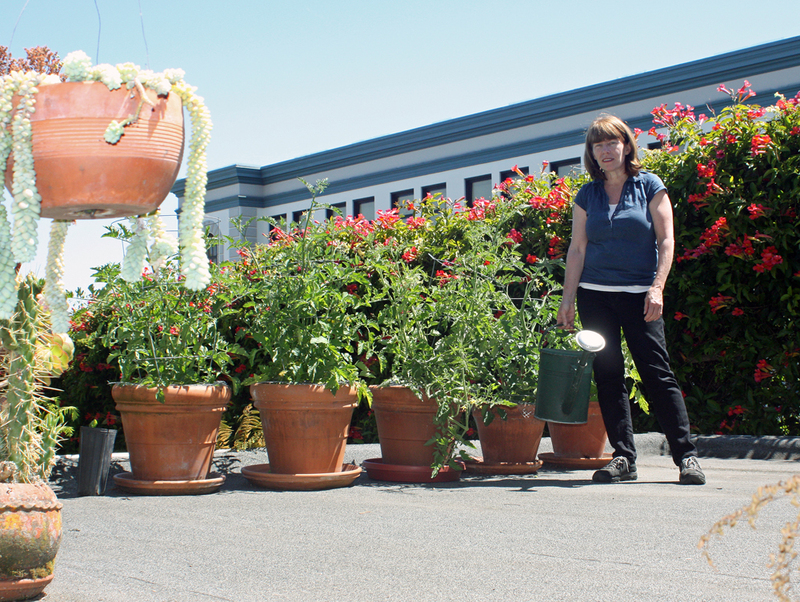 Eanes grows tomato plants on her rooftop garden in Bernal Heights. "People are forever asking what they should plant," Evans says. "My answer is always: What do you like to eat? There's nothing sadder than growing something in your garden and have it end up in the compost pile. I say this from a personal experience." Kooy knows she doesn't get much heat in her San Francisco backyard so she avoids tomatoes. "I know I can grow kale, lettuce and peas like nobody's business," Kooy says. Evans recommends talking with your neighbors who already grow edibles to find out what works well in your area. It sounds like common sense, but once you harvest your crops, you have to eat them, Eanes says. Work out how much of a crop you can eat and plan accordingly. Give away or trade what you can't consume. "Crop swaps are becoming very popular," Evans says. "I don't have chickens in my yard, but I know a lady who's got 25 chickens, so I trade various things with her in exchange for eggs." Many people think they have brown thumbs, but everyone, even accomplished urban farmers, feel the brown thumb syndrome at some point. "You have to realize that failure is inevitable for every gardener," Kooy says. The biggest challenge for aspiring gardeners is the fear of failing, Evans says. "Many are afraid to take a packet of seeds and plant them because they're afraid they might fail," she says. "But all of us fail, even those of us who've been doing this for 30-plus years. I just planted parsnips but I need to go back and replant parsnips because they didn't come up." Where to buy "Backyard Roots"
The Ecology Center in Berkeley; Books Inc., Green Arcade, Omnivore Books in San Francisco.